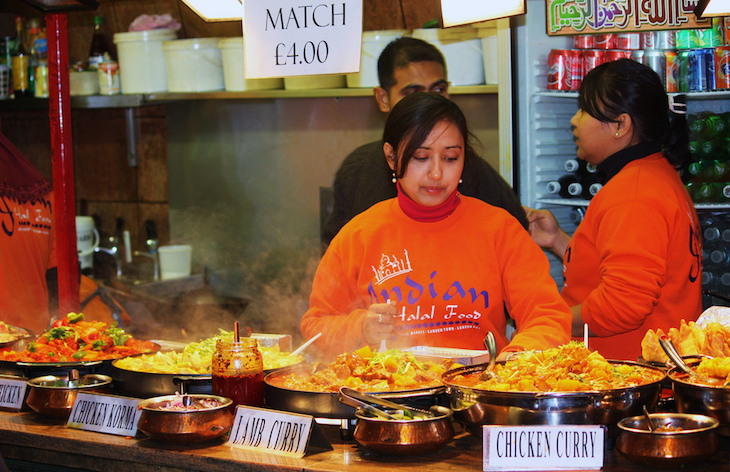 It’s commonly assumed that London’s first Indian restaurants were set up by Bangladeshi immigrants in the 1960s and ‘70s, but actually, the first one was established over 200 hundred years ago, in 1810. 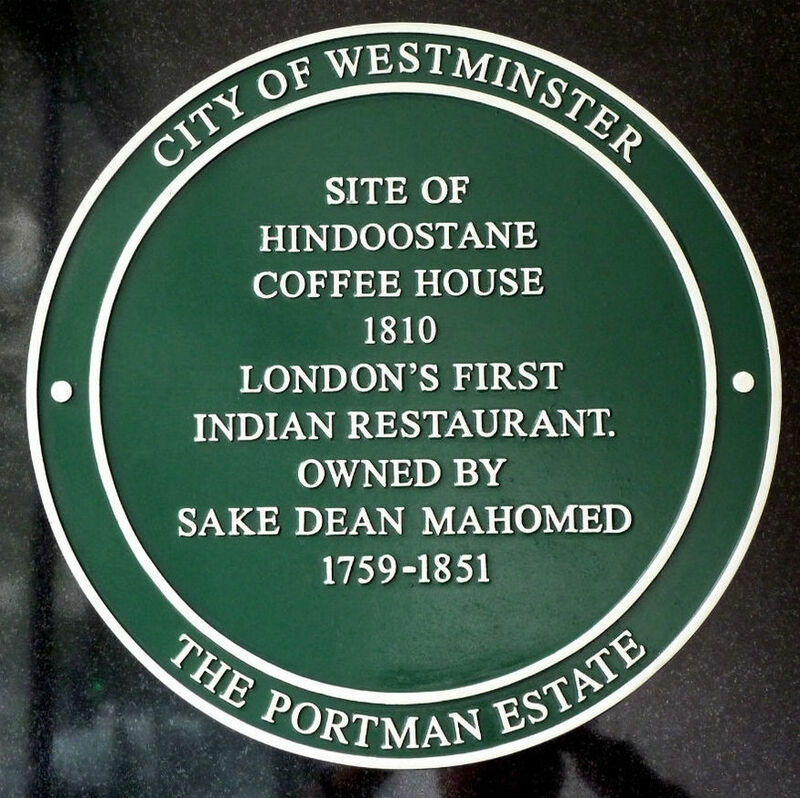 Hindoostane Coffee House was owned by Sake Dean Mahomed, a charismatic Bengali traveller, surgeon, entrepreneur and captain in the British East India Company. He was also the first Indian to publish books in English. HCH was located at 34 George Street — now renumbered as 102 George Street — in Marylebone, between Gloucester Place and Baker Street. It's now marked by a Green Plaque, unveiled on the building by the City of Westminster in 2005. Indian curry was already popular in England in the 19th century. In fact, spices had been present in English cookery since the time of the Crusades in the late 11th century. Hannah Glasse’s The Art Of Cookery Made Plain and Simple, first published in 1747, is one of the first cookbooks to give recipes for curries and pilaus. The early British curries and pilaus were very mild, flavoured with salt, peppercorns, coriander seeds, lemon juice, and more herbs than spices. By the 19th century, turmeric, cayenne, ginger, cumin, fenugreek and caraway seeds had been introduced. The cooking methods were also different; for instance, the British were reluctant to fry meat in ghee or fat, preferring to braise it in stock. The first appearance of curry on a menu was at the Norris Street Coffee House, Haymarket, London in 1773. By 1784 curry and rice had become house specialities in some fashionable restaurants in London’s Piccadilly. Indeed the ‘Mistress of Norris Street Coffee House, Haymarket’, declared in Public Advertiser, 6 December 1773, that she not only sold “true Indian curey paste” but would “at the shortest notice [send] ready dressed curey and rice, also India pilaws, to any part of the town.” This must have been the first Indian home delivery service. 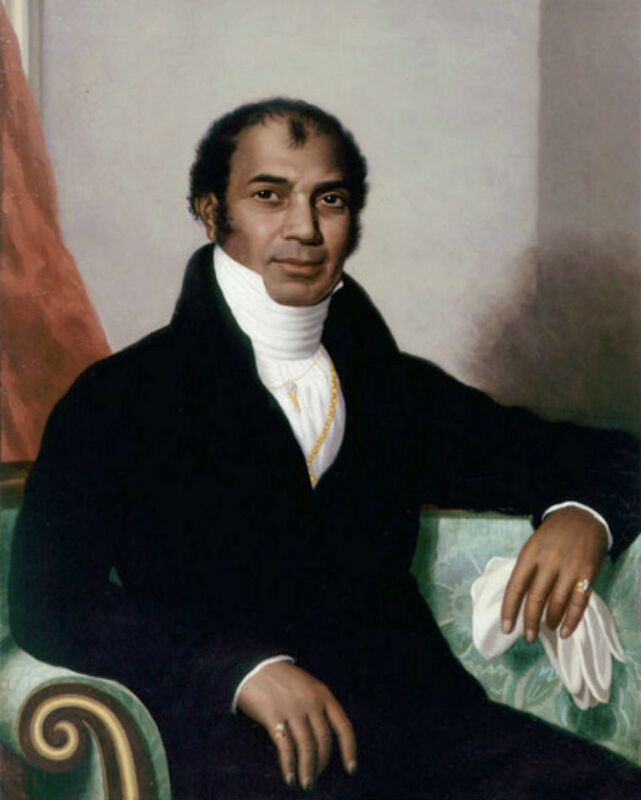 Sake Dean Mahomed by Thomas Mann Baynes (1794-1876). Sake Dean Mohamed wanted to capitalise on this popularity of spicy food by opening an Indian restaurant. He was born Sheikh Din Muhammad in 1759 in Bihar, which was then part of the Bengal Presidency in India. After his father's death, he was looked after by Captain Godfrey Evan Baker, an Anglo-Irish Protestant officer. He served in the army of the British East India Company as a trainee surgeon, and remained in Captain Baker’s unit until 1782. They both resigned and emigrated to Cork in Ireland. There Mohamed took English lessons and married an Irish girl named Jane Daly. They moved to London, and lived in Portman Square, a fashionable area popular with colonial returnees and wealthy former employees of the East India Company known as ‘nabobs’. With this target group in mind, he set up the Hindoostane Dinner and Hooka Smoking Club in 1810, which became known as the Hindoostane Coffee House. It wasn’t a coffee house in the modern sense of a casual café serving hot drinks, but a term used for many restaurants at the time as drinking coffee had become fashionable. His aim was to serve ‘Indianised British food’ in smart surroundings. Sake Dean Mahomed, manufacturer of the real currie powder, takes the earliest opportunity to inform the nobility and gentry, that he has, under the patronage of the first men of quality who have resided in India, established at his house, 34 George Street, Portman Square, the Hindoostane Dinner and Hooka Smoking Club. So, his restaurant also provided home deliveries. Mahomed had to sell it a year later in 1811 as it wasn’t making enough money (although it remained open under a different ownership until 1833). There wasn’t much of an eating out culture at the time, and his target customers were either cooking more ‘authentic’ dishes at home themselves, or having them cooked by their private chefs. A year later, he declared bankruptcy, after which he started advertising his services as a butler and valet, eventually becoming “shampooing surgeon” to both King George IV and William IV. He died in 1851. Mahomed was mostly forgotten until the 1970s and ‘80s, when a few writers began to draw attention to his work. What do we know about the Hindoostane Coffee House? Unfortunately, not much. We would love to know what was on the menu of HCH, but the only records seem to be newspaper adverts placed by Mahomed himself, and information available in The Epicure’s Almanack. The Epicure's Almanack - London's first restaurant guide, and an excellent source of information about London restaurants in the Regency period. Image courtesy of the British Library. The Epicure’s Almanack, originally published in 1815 and written by poet and playwright Ralph Rylance, was London’s first restaurant guide. 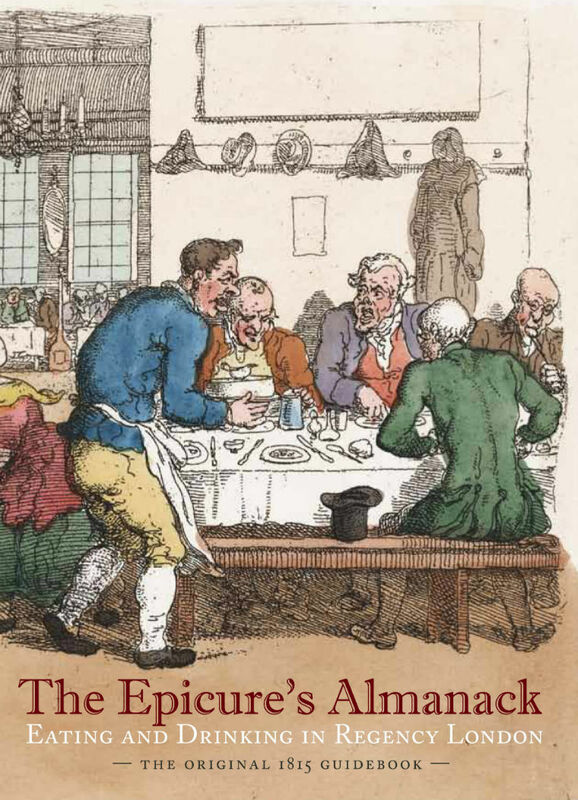 It was reissued and republished by the British Library in 2012, and is an excellent source of information about London restaurants during the Regency period. However, not much information about HCH’s food is forthcoming from Rylance either, as he wrote his book after the restaurant had closed. He refers to Mahomed as ‘Sidi Mohammed’, and writes that the restaurant “opened… for the purpose of giving dinners in the Hindoostanee style, with other refreshments of the same genus. All the dishes were dressed with curry powder, rice, cayenne and the best spices of Arabia. So this is as much of a flavour as we can get about the Hindoostane Coffee House: that it was a relaxed placed decorated in the colonial style, and probably served mildly spiced curries. We asked a number of food historians what was likely to be on its menu, but other than vague references to spicy meat and vegetable dishes, nobody seems to know. Mahomed was way ahead of his time. Indian food – which has had a rollercoaster ride in the hearts of the British nation – only really took off many years later during the Victorian period, as Queen Victoria was extremely fond of it. Due to the failure of HCH, nobody dared to open another Indian restaurant… that is, until the 20th century. In the early 20th century, sailors from what was to become Bangladesh opened eating establishments in London for members of their own communities, which started becoming more commercial in the 1940s. Following a war in their home country, many Bangladeshis came to London in 1971, and the curry house industry started in earnest. London’s first Indian restaurants after Mahomed’s short-lived effort came a century later. According to a detailed account in Peter and Colleen Grove’s Mood Food/ Menu Magazine, Salut e Hind was the first to open in Holborn in 1911, followed by The Kohinoor in Roper Street, and Curry Café in Commercial Street in the 1920s. The most successful and influential was The Shafi in Gerard Street, which opened in 1920. 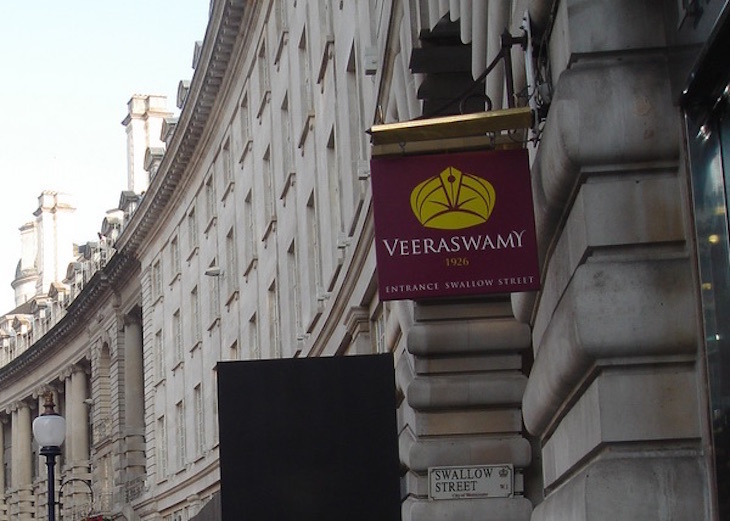 These were all aimed at Indian diners, but when Edward Palmer opened Veeraswamy in Piccadilly in 1926, he revolutionised London's Indian dining scene, making it fashionable for everyone to eat Indian. Veeraswamy—which has gone through several changes in ownership, décor and menu since then – today lays claim to be London’s oldest surviving Indian restaurant. Close behind it are Halal in Aldgate (1939), and the Punjab in Covent Garden (1946). We don’t know what Mahomed would have thought of the late foreign secretary Robin Cook declaring chicken tikka masala as Britain’s national dish in 2001. And we don’t know what he would make of today’s exceptionally diverse and rapidly evolving Indian restaurant scene. However, we have a feeling that he’s sitting in the great restaurant in the sky in his dapper suit with a twinkle in his eye, smoking a hookah pipe and nodding his approval. Pedant's note: A few respected sources spell Dean’s name as Deen, and Hindoostane as Hindoostanee; and have claimed the restaurant’s opening date to be 1809. However, we have adhered to the official information as stated on the green plaque.